The best writers are part-librarian and part-swashbuckler. At least that seems to be the career path followed by Ian C. Douglas. After a nerdy childhood spent in the company of Tolkien, Lovecraft, and a certain Time Lord, Ian ran away to see the world. This quest got him in countless scrapes, before finding himself teaching English in East Asia. After ten years of hard grammar, he returned to his native England, and graduated with an MA Distinction in Creative Writing. Since then he has written everything from online computer games to apps for children. Several of his stories have won prizes and he was a finalist in the Independent on Sunday’s writing competition. 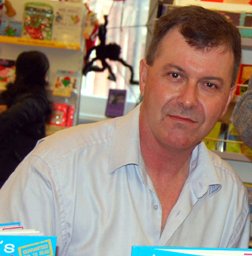 Ian is a children’s history author and visits schools with bloodcurdling tales of the past. His writing has appeared at the V&A’s Toy Museum. Ian lives near Sherwood Forest with his wife and children. When he’s not daydreaming about Martian landscapes, he teaches creative writing and writes theatre reviews. Interests include origami, astronomy and wearing silly hats. Science Fiction has always been Ian’s first love. He is delighted to launch his third Sci-fi novel, The Particle Beast, book 3 of his Zeke Hailey young teen science fiction series..